Members of Brazilian soccer team Chapecoense were among 81 people on board a chartered aircraft that crashed late Monday in Medellin, Colombia. So far, officials say at least 76 people were killed. The team, from the small city of Chapeco, was in the middle of a fairy tale season. It joined Brazil’s first division in 2014 for the first time since the 1970s and made it last week to the Copa Sudamericana finals. The news has devastated the region. The team is so modest that its 22,000-seat arena was ruled by tournament organizers too small to host the final match, which was instead moved to a stadium 300 miles to the north in the city of Curitiba. There is a sad, long history of team planes going down, always leaving a lasting mark on a country or sport, like what happened with Marshall University in 1970. Nov. 8, 1948 - The Czechoslovak national ice hockey team plane crashes in the English Channel just off France, killing five members including IIHF Hall of Famer, Ladislav Trojak. May 4, 1949 - The plane for Italian soccer club Torino A.C. crashed in its hometown of Turin. The four-time league champions lost 22 members, including 18 players, which compromised most of its senior squad. Jan. 7, 1950 - The Moscow VVS ice hockey team’s plane crashed near Sverdlovsk. They lost almost the entire team, 11 players, in the accident. Feb. 6, 1958 - The plane carrying English soccer champion Manchester United crashed in Munich, Germany. The Munich Disaster is still recognized today in both England and Germany. A total of 23 people died in the crash, including eight soccer players and three members of the club. Aug. 14, 1958 - The Egyptian fencing team was on a plane that crashed in the Atlantic Ocean near Ireland, killing all 99 people on board, including six members of the team. July 16, 1960 - Members of the Danish national football team were on a plane that crashed in the strait separating Denmark and Sweden, killing all eight passengers, including three members of the national team. Oct. 10, 1960 - The airplane carrying the Cal Poly-San Luis Obispo football team crashed during takeoff in Toledo, Ohio. A total of 22 people were killed, including 16 members of the football team. Feb. 16, 1961 - The entire U.S. figure skating team was killed on a flight heading to the World Figure Skating Championships when their plane went down Prague, Czech Republic. A total of 18 team members and 10 coaches and officials were killed in the crash in Belgium. April 3, 1961 - Eight soccer players from the now-defunct Chilean soccer team CD Green Cross were killed along with two coaches when their plane went down in the Las Lastimas Mountains, killing a total of 24 people. Rescuers spent fruitless weeks searching for the missing plane and symbolic funerals for the missing players drew huge crowds in Chile. The wreckage of the crash was finally found 54 years later by hikers. April 28, 1968 - Five members of the Lamar Tech track team, their coach and a pilot were killed during the return flight from a meet in Iowa when their plane crashed on landing at their hometown of Beaumont, Texas. Sept. 26, 1969 - While traveling home from a special holiday match, almost every member of the Bolivian soccer team “The Strongest” was killed in a crash that left a total of 83 people dead. Sixteen soccer players, their coach, and two team staffers died in the crash near Viloco, Bolivia. Oct. 2, 1970 - One of two planes carrying the Wichita State football team to a game against Utah State crashed in Colorado, killing a total of 31 people, including 14 players. An investigation blamed the crash on the fact that the plane took a sightseeing route through the Rocky Mountains that ended up in a dead-end canyon. Nov. 14, 1970 - Most of the Marshall University football team was killed in a crash as the team was returning from a loss to East Carolina, in a disaster that left all 75 people on the plane dead. A total of 37 players died in the crash in Huntington, West Virginia, in addition to nine coaches and 25 boosters. It remains the deadliest tragedy involving an American sports team in history. A movie was made about the disaster, “We Are Marshall,” starring Matthew McConaughey and Matthew Fox. Oct. 13, 1972 - Members of the Uruguayan rugby team Old Christians Club were involved in what has become known as the Miracle of the Andes, when their plane crashed in a disaster that claimed a total of 29 lives, including 11 players. The 16 survivors of the crash weren’t rescued until two months later, forcing them to survive high in the mountains with little food and no heat, leading to cannibalism and a desperate 10-day trek through the elements by two survivors for help when the search for the plane was abandoned.The incident became a movie called “Alive,” starring Ethan Hawk and directed by Frank Marshall. Nov. 29, 1975 - The short-lived Formula 1 Embassy Hill racing team was more or less wiped out when six members of the team died in a crash while returning to England from France. Team founder and world champion Graham Hill was piloting the aircraft, and both he and his only other driver died. Dec. 13, 1977 - The plane the University of Evansville men’s basketball team crashed on takeoff carrying them en route to a game against Middle Tennessee, killing 29 people on board. The crash killed coach Bobby Watson, 14 players, and other team members in Evansville, Indiana. Aug. 11, 1979 - All 17 players and staff of the Soviet top division Pakhtakor Football Club team were killed in a mid-air collision over the Ukraine, that took a total of 178 lives. March 14, 1980 - Members of the U.S. amateur boxing team were on a plane that crashed in Warsaw, Poland, while traveling from New York City, killing a total of 87 people on board. Fourteen members of the boxing team died in the crash. Nov. 25, 1985 - A small plane carrying the Iowa State women’s cross country team crashed on approach to Des Moines. Coach Ron Renko, assistant coach Pat Moynihan, and team members Julie Rose, Susan Baxter and Sheryl Maahs were killed in the crash as they were returning them from a triumphant meet in Milwaukee. Dec. 8, 1987 - The plane carrying members of the Peruvian soccer club Alianza Lima crashed just short of their home city of Callao, killing a total of 43 people, basically the entire team. June 7, 1989 - Professional soccer players from Suriname playing on an exhibition team were killed on a flight home from the Netherlands when the plane they were on went down on final approach, killing 176 people on board. A total of 15 soccer players were killed. April 28, 1993 - Nearly the entire Zambian national soccer team was killed flying to a World Cup qualifying match in Senegal, when their plane went down in the Atlantic Ocean near Gabon. A total 18 players and five team officials died in the crash. Many fans say this was among the most promising teams the country ever produced. Jan. 27, 2001 - The team plane for the Oklahoma State University men’s basketball crashed near Denver on its way back from a loss against Colorado during a snow storm. The crash killed players Dan Lawson and Nate Fleming, and six team staffers and broadcasters. Oct. 24, 2004 - The Hendricks Motorpsorts team aircraft crashed on approach in Virginia on a flight from North Carolina. Ten people were killed in the crash, including team president John Hendrick and former driver and owner Ricky Hendrick. 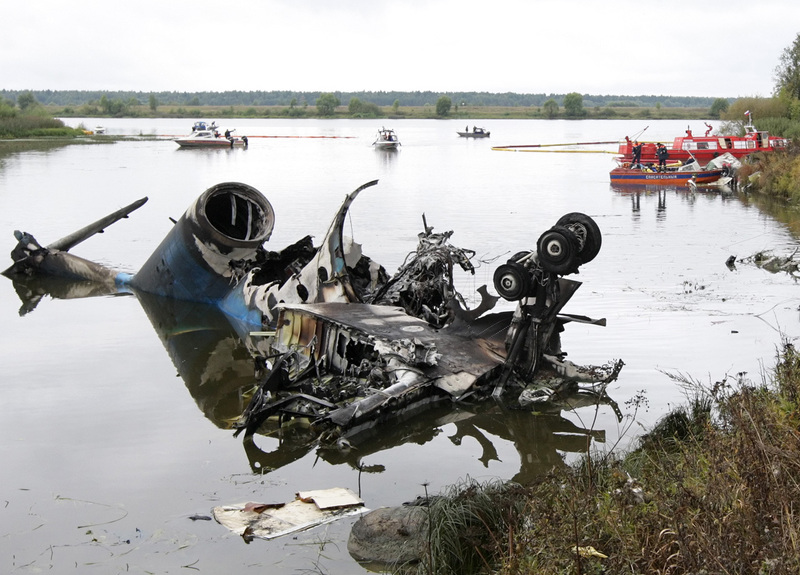 Sept. 7, 2011 - A private Russian jet carrying top Russian hockey team Lokomotiv slammed into a riverbank moments after takeoff, killing 44 people on board, during a flight from Yaroslavl to Minsk, the capital of Belarus. Both Russia and the world of hockey were left stunned by the deaths of so many international stars in one catastrophic event. Czech players Josef Vasicek, Karel Rachunek and Jan Marek, Swedish goalie Stefan Liv, Canadian coach Brad McCrimmon, Latvian defenseman Karlis Skrastins and defenseman Ruslan Salehi of Belarus were among those killed. Slovakian national team captain Pavol Demitra, who played in the NHL for the St. Louis Blues and the Vancouver Canucks, was also among the dead.